As conventional wisdom would have it, Apple’s ignominious defeat in the Department of Justice’s ebook price-fixing suit a few years back so soured Apple on the book business that the company let its iBooks division languish ever since (see “Explaining the Apple Ebook Price Fixing Suit,” 10 July 2013). That wisdom, however, isn’t entirely true: Apple has, as it characteristically does, made incremental improvements to its ebook reading app a number of times since its DOJ debacle. 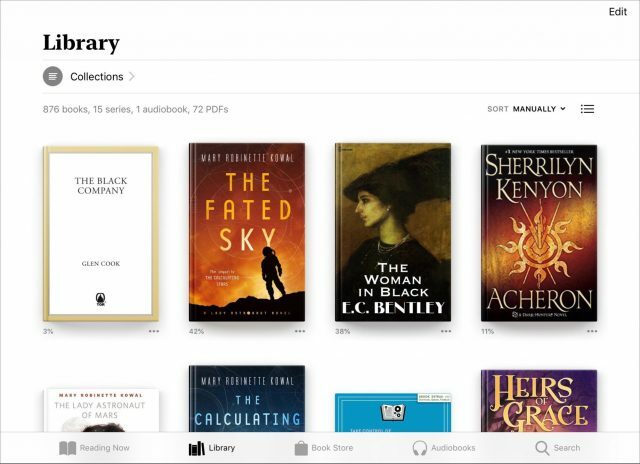 Nonetheless, iBooks has looked almost completely unchanged since Apple demolished its skeuomorphic wooden shelving back in the early days of iOS 7 (see “Apple Unveils Completely Redesigned iOS 7,” 10 June 2013). Until now. In fact, “iBooks” is no more: in iOS 12, Apple has re-christened the app “Apple Books.” At least that’s what it calls itself internally; the app icon is merely called Books. With the new name comes a new look—for those parts of the app you spend the least amount of time using. Let me explain: once you have a book open and you’re actually reading it, everything in the new Books app looks and works much as it always did. The page layouts look the same. The typefaces you can use to display your books remain the same. Scrolling through books, searching within books, marking up books, even turning pages (including the app’s skeuomorphic page-turning animation) have survived the journey into iOS 12. That’s smart: most of us spend our time in an ebook app reading, and few of us would want a flashy new book-reading interface to distract us from the book itself with a bunch of tinkling bells and high-pitched whistles. What has changed is the virtual space in which your ebooks reside and the stores from which you obtain them. The changes start with the Reading Now screen, the first screen you see when you open Books. It presents the books you have read most recently, arrayed in a spacious, side-scrolling list of large book covers—displayed large enough so you can read the title and the author! At the left end of this list is your “current” book—the book you have read most recently, open to the page where you left off. On an iPad, this image is even large enough for the text to be readable. The Reading Now screen is the initial portal to your library. 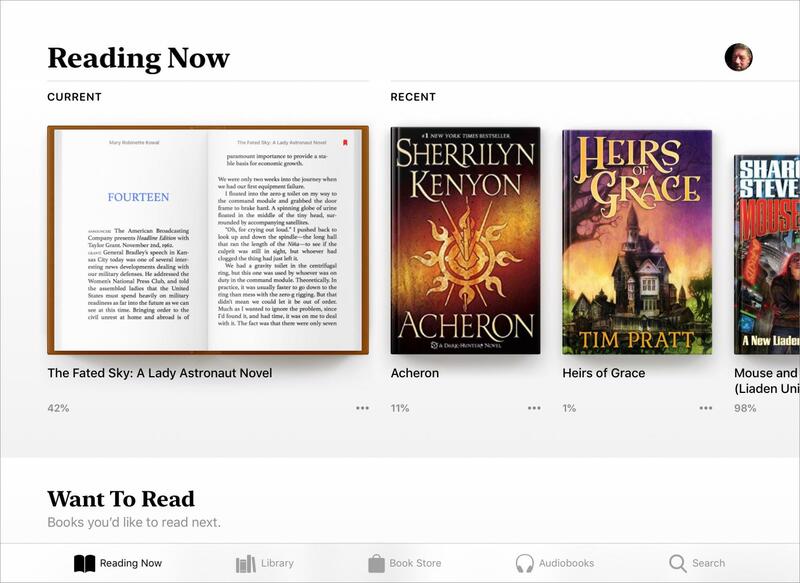 Each of the books displayed in the Reading Now list includes a percentage showing how far you are into the book, as well as a More (•••) button that provides a menu of commands you can apply to that book. 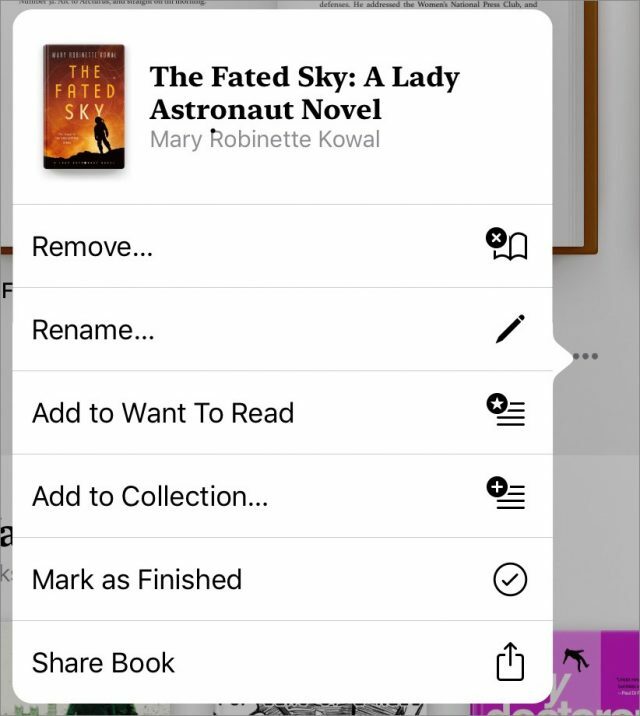 From this More menu, you can remove a book, rename a book, add it to a list of books you want to read, add it to a collection, mark it as finished, or share it with others. 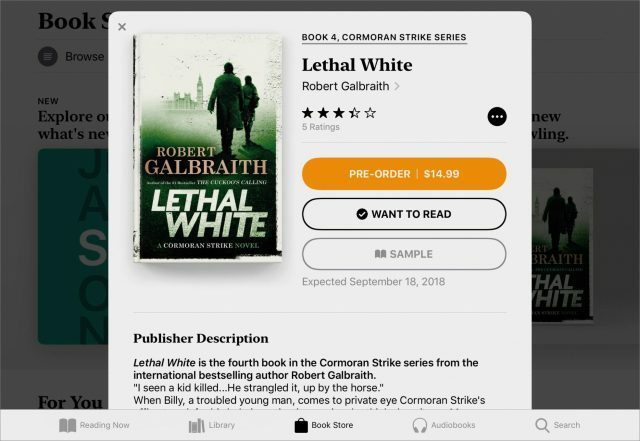 Note that you share the title, author, and, if available, a link to the book in Apple’s online Book Store, not the book itself. Things you can do with a book other than read it. Want To Read: The first time you open the Books app, this list may appear, pre-populated with books that Apple thinks you might want to read, based on your past reading and purchasing habits (I say “may” because that’s how it worked for me; Adam Engst saw no such list until he added a book to it manually). Over time, as you exercise the Want To Read command, this list will contain books that you have added instead of Apple’s starter suggestions. For You: This list comprises book recommendations based on your reading and purchasing history. Unlike Want To Read, you can’t add books to this list; Apple Books does that for you. 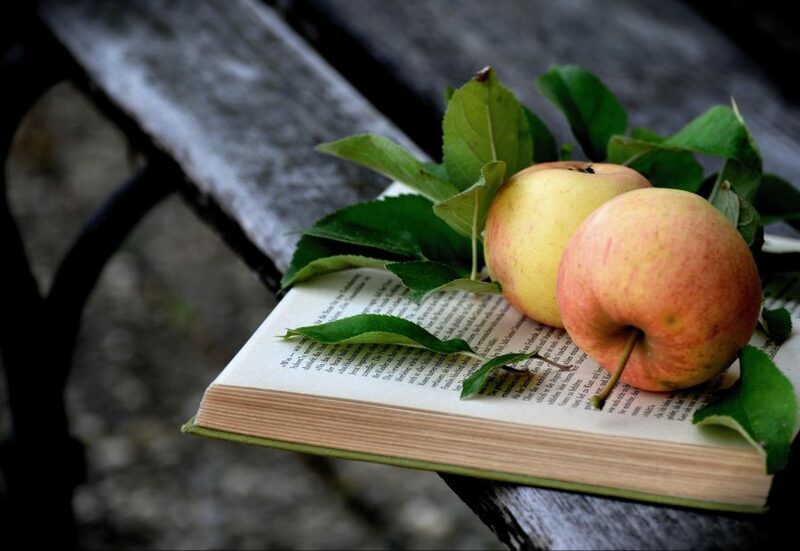 Featured Books: The name of this list can vary: it displays books that Apple is promoting in its Book Store. As I write this, I see “Read It Before You Watch It,” which contains books that have been made into movies. The Reading Now screen is a serviceable entry point, but when you want to wander through the riches of your personal book hoard, tap Library at the bottom of the screen. Your books are still in your library, but the Library has changed. This screen, initially at least, displays your complete library of books: EPUBs, audiobooks, and PDFs. 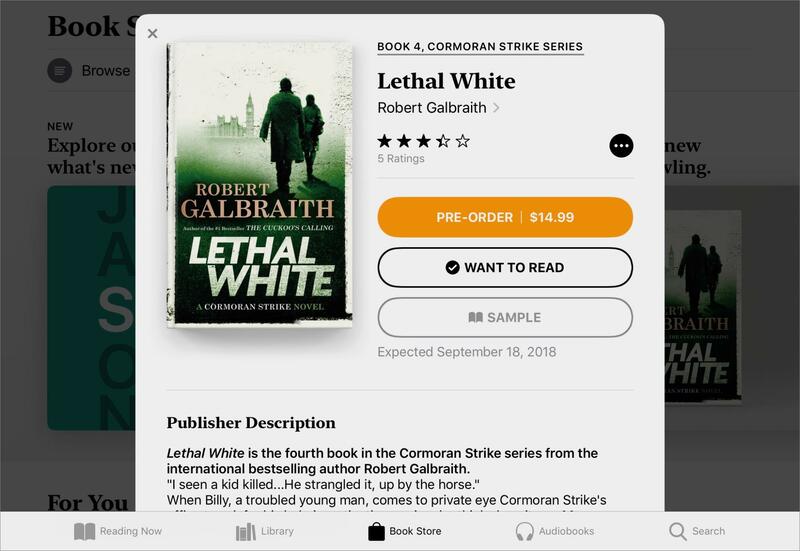 You can display the books by their covers either in rows of big thumbnails or a list of smaller ones, and you can sort the books by title, author, most recently opened, or in a manual order that you decide. The screen also provides information that was previously hard to get: how many books of each format your library contains (I currently have 876 books and 72 PDFs but only 1 audiobook). What about your carefully thought-out collections? You still have them: tap the Collections menu above the list of books and then tap the collection you want to display. All of your collections survive the trip from iBooks, with the exception of your old “Books” collection, the default collection into which your EPUBs ended up when you hadn’t assigned them to any other collection. Instead, when you first open the Books app, you see an alert telling you that “Books” has been renamed “My Books.” You’ll still see a Books collection, and it is still the default repository for your EPUBs, but now it lists all of your EPUBs. Want To Read: You’ve seen this before on the Reading Now screen, but it is also available as a separate collection screen in the Library. Finished: This lists books you have marked as Finished. PDFs: All the PDFs in your library. Downloaded: The books that you currently have on your device; your complete library lives in iCloud. This change has consequences. When you choose Remove from a book’s More (•••) menu, you can opt to remove a book from the currently displayed collection, remove the download (while keeping it in your library and on any of your other devices that use the same library), or delete it everywhere. This refined capability, with its improved messaging, is welcome. One caveat: During the transition period, when you are most likely to have some devices running iOS 11 or macOS 10.13 High Sierra and others running iOS 12 and 10.14 Mojave, changes you make to collections in Apple Books other than completely removing a book from your library are not reflected in iBooks, nor are changes to collections in iBooks reflected in Apple Books. A helpful alert and a notification both let you know this. Once your devices are all updated, you won’t see this alert. Right now, Apple Books seemingly offers not one but two stores from which you can purchase books: Book Store and Audiobooks. Or maybe it offers separate entrances to different departments of the same store, because although each has its own button on the Books app’s toolbar, they’re really the same service. In any case, Apple has redesigned its book vending service to match the recent revamps of the company’s music and app stores, with the typical New & Trending, Top Charts, and similar sections on the main screen. This screen also contains a For You section, similar to that on the Reading Now screen. In addition, the main screen offers a Browse Sections menu, so you can quickly tunnel down to various book genres and other specialized lists. The new Book Store also integrates with the Want To Read standard collection offered by Books. When you tap a book’s entry in the store, you have the option of adding it to your Want To Read collection. While browsing Apple’s Book Store, you can mark books you are considering. The Search pane in Books no longer hides above the top of the screen where you have to swipe down to see it, but, instead, is invoked by tapping the Search icon at the bottom of the screen. Like before, as you type your search term, Books displays the books from your library that match, but it now also offers suggestions you can tap to find matching books, similar to how searches in the Music app work. I spend a lot of time reading books, and a lot of that time in iBooks, so the thought of a major revamp of Apple’s ebook reading app concerned me. Fortunately, Apple seems to have executed the iBooks-to-Books transition gracefully. The company has made changes where needed, but where they weren’t, Apple’s engineers restrained themselves admirably. I welcome the new library management and search features—I’m particularly happy with the new flexibility of book collections—and am grateful that none of Apple’s changes are in my face when I’m doing what I do most often with the app: reading books. How much of your reading do you do on an iOS device, and in which apps? Let us know in our quick three-question survey. I hope they have the Mac app load PDFs and display them internally rather than launch Preview. The reason is that I like to be able to browse my library when I’m looking for something to read. The new Apple Books shows a maximum of 8 books at a time on my iPad, and only 4 on my iPhone. That really isn’t nearly enough when you’re trying to browse through over 2000 books. (The grid layout is actually worse; it shows fewer books.) It seems clear that Apple expects people with large libraries to find books by searching , either by title or author. Browsing doesn’t seem to have been considered at all. Being able to select one’s preferred icon size would solve it; but on the whole, it seems that Apple prefers to offer a static experience, with few options for customisation. I abandoned iBooks after the iOS 9 version destroyed my carefully sorted and arranged library by author+series. Since iBooks didn’t provide an author+series sorting/arranging option, I had to find ebook reader that could. I found the MapleRead applications by MaplePop and now use MapleRead SE on my iPad Minis. I settled on the ePub and PDF formats and use Calibre on my Mac to strip any DRM (if needed), edit the metadata (as needed) and to convert the ebooks to either ePub or PDF format (again, if needed). Books will not be used on my Mac/iOS devices. Sigh…yes, I’ve been thinking it’s time to switch. Thanks for the recommendation; I’ll check it out. It would almost be worth switching, just to get away from the endless determined push to use Apple’s book store. Even if you disable the store entirely in settings, the “Search” function on the iPad wastes fully half the screen telling you that you’ve turned it off and offering to turn it on for you. I don’t buy any ebooks from which I can’t remove the DRM. I don’t buy any ebooks from which I can’t remove the DRM. Query. When does a book move from Want To Read to Reading Now? I have started reading a book in Want To Read collection but it doesn’t show up in Reading Now collection. I have started reading a book in Want To Read collection but it doesn’t show up in Reading Now collection. Apart from the false claim that I’m not reading anything right now, all the Reading Now screen shows me are two buttons inviting me to explore the Book Store or Audiobooks, a For You list (presumably based on all the books it thinks I haven’t read), and an Everyone’s Talking About… list. Not terribly useful. The loss of the text database of all books with name, author, collection, etc. will drive me to another source for my book habit. What text database are you talking about? I don’t recall seeing such a thing in iBooks for iOS. iBooks (now Books) on the Mac still has a list view that shows all your books in a textual table. That list does show title, author, date, size—though not collection, as a book can now belong to multiple collections. Thanks. I should have been more precise. The prior iOS iBooks app had a format that resembled a spreadsheet, with columns for Title, Author, Collection, and I think Date Acquired. It was editable so you could correct or modify entries to your liking, such as renaming Collections, listing an author’s name uniformly, etc. I cannot find any way to do that in this iOS. The listing of all books with thumbnail pictures does not meet my desires and I am looking for another app in which to keep and use my digital library. Apple has used a similar design to screw up the Apps app format as well, with a complete waste of iPad screen space, IMHO. Pretty much exactly my journey away from iBooks, too. I only wish that Calibre and Mapleread were as good with audiobooks as they are with ebooks.